Serving the Pittsfield, Great Barrington, and North Adams, MA communities with state-of-the-art orthodontic care, Dr. Raymond Meandro and our team provide our patients with the confidence and pride that comes with a beautiful smile and a healthy bite. Our office is known for our welcoming, patient-friendly atmosphere, where each member of our staff goes the extra mile to make all treatments proceed as smoothly as possible. 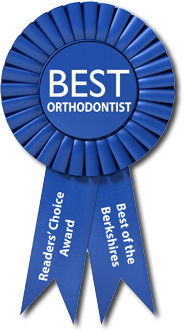 With over 26 years of experience, Dr. Meandro has been voted “Best Orthodontist in the Berkshires” for good reason! His commitment to personalized patient care is seen in each beautiful smile he creates.Unlike many offices at Meandro orthodontics treatment is done by Dr. Meandro himself to ensure the quality of care your children deserve. Our treatment options are designed to meet each patient’s unique needs and goals and include traditional braces, Clarity™ clear braces, early interceptive treatment, and Two-Phase treatment. As a practice, we believe in creating a positive experience for our patients, and we work hard to ensure a comfortable, open, stress-free environment where you and your family will always feel welcome. We are excited to share in your orthodontic experience and look forward to meeting you and your family. Please feel free to contact our office to schedule a complimentary consultation today! Your children are special. They deserve the care of an orthodontic specialist. At Meandro Orthodontics, our practice is limited to the treatment of orthodontic problems. That is our specialty. As a certified orthodontic specialist, Dr. Meandro has received the specialized training needed to be recognized by the American Association of Orthodontists. He has a particular interest in the care and treatment of orthodontic problems in children and teens.